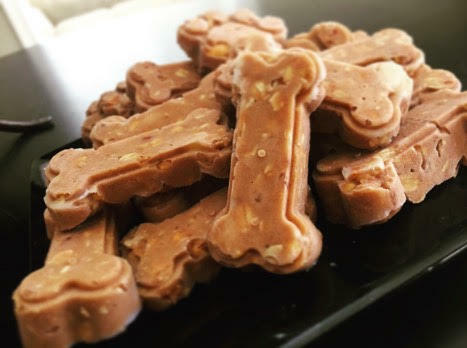 This is probably one of my favorite homemade dog treat recipes, for a few reasons. Mainly because most of the ingredients are common household items, and it repels fleas! Perfect for summer. Step 7: Once you have your mixture – it’s time to fill your molds! If you do not have molds, you can also use ice trays or parchment paper. Step 8: Freeze for 45 minutes – 1 hr. Step 9: It’s time for your pup to enjoy this cool, healthy, flea repelling creamy treat! Save this recipe for year round delicious-ness and just change up the ingredients! During the fall I like to substitute the banana and instead add pumpkin or sweet potato. In the spring I’ll go another direction and add in some frozen blueberries or strawberries. There is no limit to the amount of possibilities and outcomes you can make with just these basic steps and ingredients! This is an awesome recipe to have handy all year around.